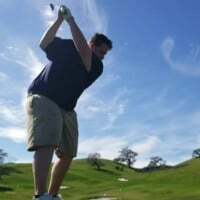 I'm really frustrated with not being able to improve on my swing. My issue is that I keep taking the club inside. Plus I believe it limits me on my back swing as you can see I can't take it back. I think I am as low as I can go (index 11.5) and without drastic changes I won't be able to improve. Things I suffer: hit behind the ball, inconsistent contact, push to the right. Thanks for the help. What I would suggest is to think and focus on your swing plane, and how all of the parts of your body can facilitate getting on that plane. Right now it looks like your arms are locked in with your shoulder and hip turn. You want them to work together, but still have some separation of movement. Beyond just adjusting the mindset, you put a ball directly behind the club at set up, and then try to push that ball straight backwards on your takeaway. I would do this while maintaining the shoulder turn so you can feel that separation.